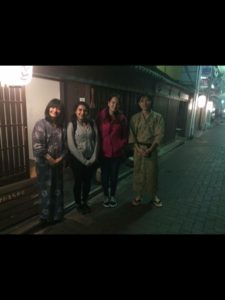 Why & When & How to go to Kyoto? Kyoto is the second most popular destination of visitors, having the most iconic cherry blossom views during Sakura and being more of a traditional city with small wooden houses, giant and beautiful temples, less noise and less people on the streets. I had expected a combination of elegant temples and fascinating forests well as glimpses of Japanese culture that would make you cry while leaving the city. 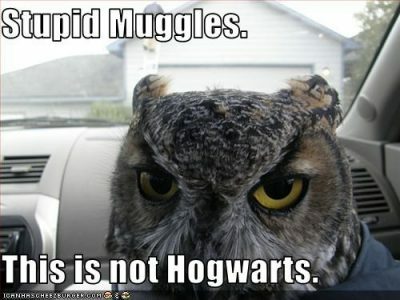 And yes, i found what I had looked for. Best season to go there is Sakura season, which is late March-early April, if you can afford the super expensive plain tickets as I could not do 😀 Summers can be quite humid in Japan; winters on the other hand are as cold as Northern Europe that I could say from my Tokyo experience in January last year. Therefore, the second best time to visit is early fall or late spring. I’ve been there in early May, and got a bit disappointed due to heavy rain but it is not always the case with the weather. If you are lucky enough, you should be fine. There are direct flights to Osaka where you can take a train or bus to Kyoto takes an hour but you can also find trains and buses from any other distant city including Tokyo. We took a speed train (aka shinkansen) takes 2 hours form Tokyo to Kyoto which costed 13000 yens. 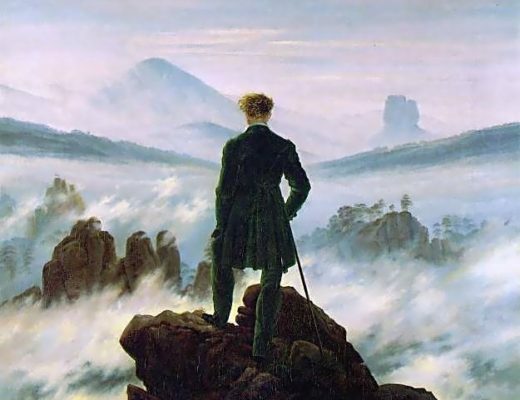 Definitely take a bus if time does not matter to you (takes like 9 hours) and you can find all detailed information about that option from Japanguide.com. 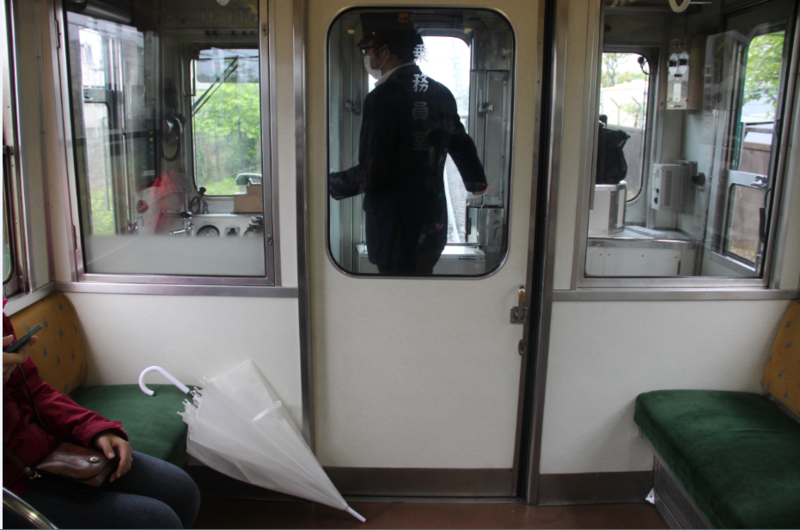 Perfect train rides are when you run away from the rain. I’d known that accomodation would cost much more than what I got used to pay in Southeast Asia and unfortunately, it did. But luckily, every single night turned into a real experience. 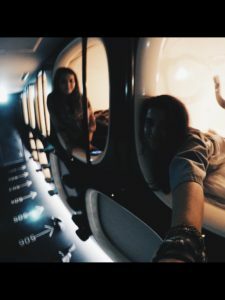 I’d come across to an article about a “spaceship themed” capsule hotel in Kyoto called 9hours before I booked anything. And for sure I wanted to experience a very Japanese style guest house as well. Eventually we ended up booking 2 nights in Oki’s Inn that we found on Hostelworld.com and 1 night in 9hours via Booking.com . Oki’s Inn is literally the best stay I’ve ever had in my entire life! It is a traditional Japanese home in which the owner couple lives in upstairs and a few guest rooms are availble in the downstairs. The house even has a very small back yard which connects you to a Japanese style living room*. And maybe the best part is you’ll meet the cutest hostel owners ever that will eventually make you “oh guys i am gonna come visit you again” at the very end. At Oki’s, I met a Taiwanese filmmaker that had worked with Ang Lee and Zhang Yimou who are the 2 iconic Chinese directors that my travel mate was just finishing a paper about on that very night. I met a Dutch lady who had been travelling all the way from Russia to Ozbekistan* alone, making an original “Asia” trip rathen than the exotic stuff rest of the mortals dream about. For that lovely place, I can even sleep in the reception if they have no vacancy during my next visit to Kyoto. Wow, OK maybe it was not a fair competition for 9hours already. Overall, I’d never prefer 9hours rather than Oki’s. First of all I would not really understand whether it is “spaceship themed” or not if I had not read that article. Upsides: it was designed very modern and minimalist, even could be called as a high end capsule hotel. The 9hours robes they give you creates sort of a spaceship atmosphere as if you wear the same uniform with everyone else around you. I also have to admit that capsules look pretty cool with all the spot lights and spaceship-like layout. They really take keeping the rooms silent serious though; some other guest even “hushed” me while I was whispering to my friend in the capsule next to mine. For that, they also put a a smart system into each capsule that wakes you up by enlightening the capsule incrementally, instead of alarms (worked for me but not for my friend, be proud of your silence policy now) One thing I have to mention, we left our luggages the day we checked out and went back in the evening. They were quite aggressive about us using the common areas and bathrooms before we change some stuff in the luggages and leave. I mean, it is just bathroom, be a bit more Japanese for God’s sake! Do you recall a picture of red columns placed in a row, look like all going to infinity and definitely spectacular with sunlight leaking in between, leaving shiny kisses on them? 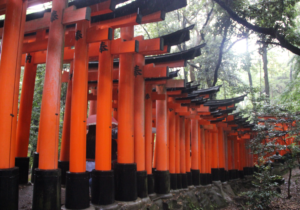 That’ Fushimi Inari-taisha. Sitting at the base of Mount Inari which is a very good option for a hike, this shrine has been traditionally hosting merchants and business men to worship. Downsides are, since it is the top attraction in the city, there are constantly two lines of people going in and out og the red gates so it is not a very perfect time to feel sophisticated, gripped by the Japanese vibes, or at least catch a cool picture. 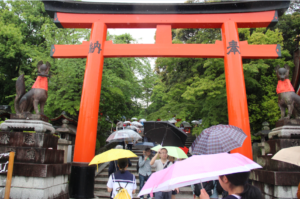 Why I paired Gion and Fushimi Inari is because they are close to each other if we pair up the top attractions, so after your visit to Fushimi Inari, go in the half-traditional half-touristy part of Kyoto: Gion streets! 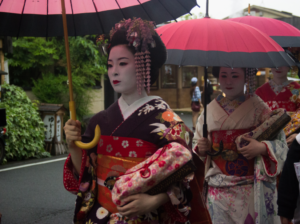 On our way to Gion; we were expectiong to see a geisha fading away from the end of a street or very old local shops selling some stuff we have no idea about. Instead; we found shops selling items designed in a mixture of traditional and modern tastes, small handcraft shops and hippi second hand clothing stores. I could say that the night and the evening in Gion are quite different. While it is quite vibrant during the day like every other tourist attraction, at night the streets are rather calm with small wooden houses lightened up with traditional Japanese lanterns. I don’t really remember the names of the stores, but I bought a lot of stuff from both traditional and modern stores; Japanese are just so good at design! On our first night, we left Oki’s Inn and went to Musashi Sushi based on recommendation almost after 10 PM, starving and starving deeply for sushi. It is a very small and a classic Japanese sushi restaurant with a fresh sushi running on a band so that you can instantly pick one and pay according to your empty plates. We waited for half an hour, realized how popular this place among tourists and really liked the sushi they make. There was not any super-unique sushi but they were all quite tasty and fresh. Try the tempura with cabbages. Does not sound very attractive but it is delicious !! 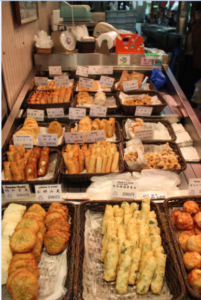 Another must-see is Nishiki Market. Some of the stalls staying open until 8-9 PM, go there just before the sunset. After seeing different Japanese markets and bazaars, I think this one was the closest to the “bazaar culture” in my home country. Treat yourself with various tempuras, dried fruits, grilled meat and weird octopus-look-like thing that I could not really understand what is in it 😀 But anyway, the market is rather clean, well-organized and stalls are not very alike. 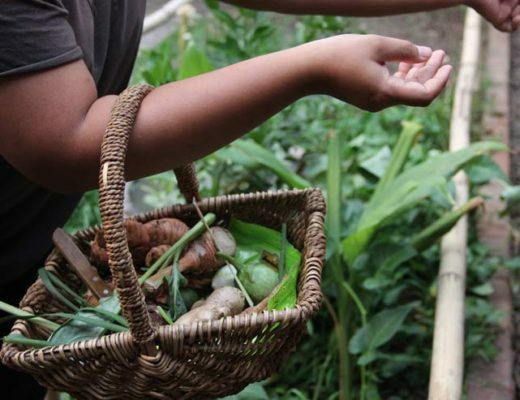 I liked going up and down for a couple of times, liked everything I picked and tasted. Recommended! After a few months have already passed, I now realize that Arashiyama was “the Kyoto” I had had in mind before even going there. 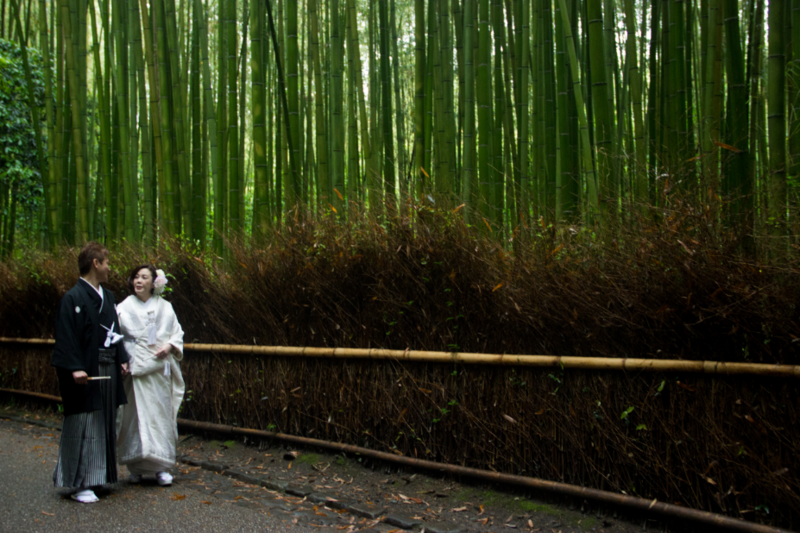 Located on the north-west district of the city, Arashiyama takes a bit long but definitely worths it to go all the way up there. 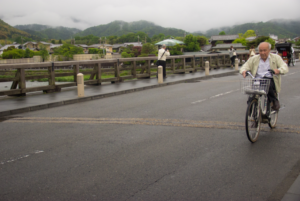 You can expect a river and a long wooden bridge with Japanese old men riding bikes taking huge mountains behind them; blocks of old small wooden houses and shops look all together like a small village, temples, occasional gesihas in the village streets and BAMBOO FORESTS. 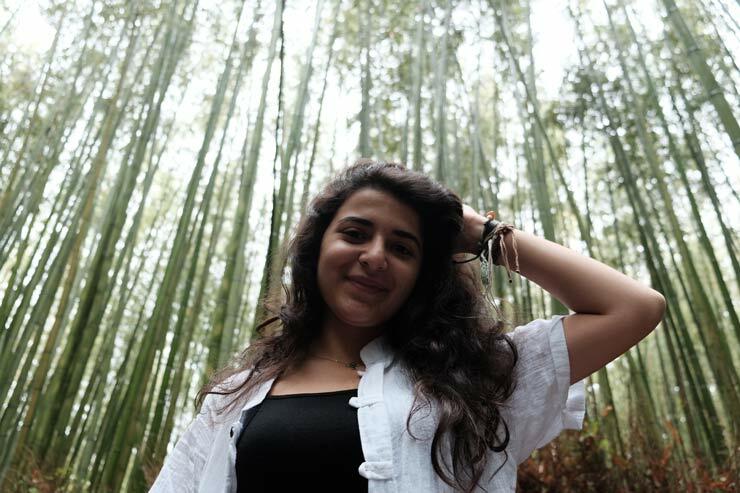 Going there in a gloomy weather, I think bamboo forests really embodies wisdom, peace and beauty. Going there quite early for some good shots (Arrived Arashiyama between 9-10 AM), we were accompanied by a Japanese couple having their wedding picutres, brah so cliche! After a walk in the bamboo forest paths, we found a very good bakery in one of the wooden houses and head to Sagano Scenic Railway in Arashiyama. A friend of mine told me that this train road is preferred mostly by elderly or couples but definitely “scenic”. We purchased one-way tickets for the train and waited at the old train station which was quite nostalgic; the view during the railway was more than scenic. IT WAS STUNNING. Despite old women who constantly take a picutre of every single waterfall and mountain, the nature there was really breath-taking. After this lovely rail-road trip, you have an option to go back if you purchased a round trip ticket. After the guy at the reception told us that “there is a metro somewhat is a walking distance from the end point of the trip” and we took it. 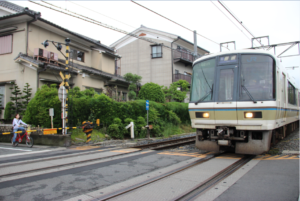 Where we got off from the train was literally the real suburbs of Kyoto. We were left in the middle of a field, with only 2 people in our sight, walking randomly around. 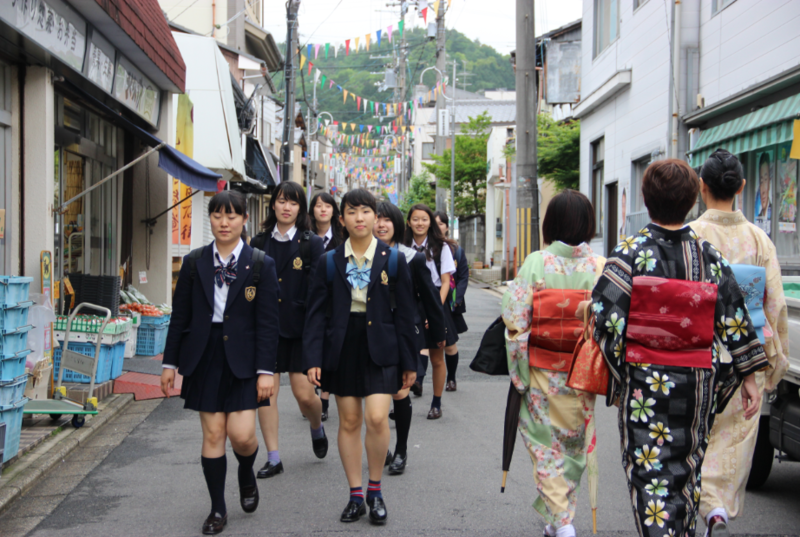 We finally could find a way to the station but until then we passed very plain buildings, a hospital, a playground, supermarkets and super quite streets; in short, we made it to the places where a normal local in Kyoto would live. It sort of looked like the plain suburbs of the US but a regular small European city with narrow roads and supermarkets on the way. Following this random walk, we came across to a very interesting train and saw that it is heading to city center, the direction we should be on. Our next stop was Ryoan-ji. There are a lot of temples in Kyoto : “…the biggest …” or “…the oldest..” But we wanted to see this both since a friend recommended and we also want to see what a zen garden looks like. 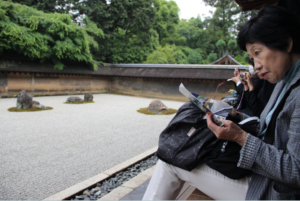 Kyoto is the place where zen gardens were originated by Zen Buddhism monks and Ryoan-ji is maybe the most iconic one. During centruies, the small rocks in that garden are arranged carefully with special hard harrows by monks to be able to meditate in an imitation of the nature’s perfect harmony. 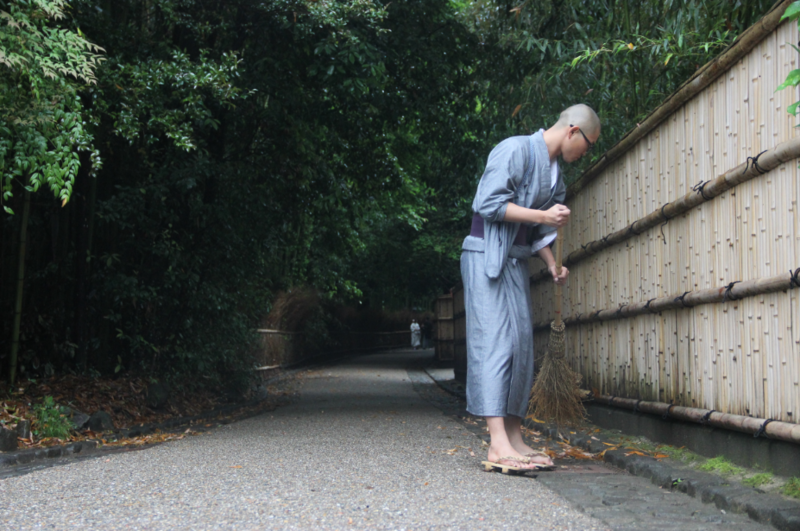 In Ryoan-ji, there were only 4-5 foreigners that I could see, almost all the visitors were Japanese people, especially young students in the same uniforms. I had known how Japanese respect and transfer their culture to next generations, especially under the symbol of Hiroshima and Nagazaki but seems like they respect the spiritual side of their culture as well. I went Kyoto with the full intention of ultimate sightseeing. And instead, people’s stories that I could also be a part of changed my entire trip. I’ve already mentione the Taiwaneese filmmaker, that we could not even think of getting an e-mail after the long talk. All the other people I met in Oki’s, a travelling couple, a young English teacher living in Vietnam and a solo traveler went all around Asia and finally, Oki’s Inn itself made me feel like I was home, hanging out with friends instantly.Coincidentally I realized that a very nice person and talented photographer, Lena, that I met on the night train to Hanoi was visiting Kyoto at the same time I was. We managed meeting, had an early=evening conversation in a cozy cafe sharing a huge dessert. Moreoever, we came across to a friend from Hong Kong in the common area of 9hours. Coincidentally, I realized that a very nice person and talented photographer, Lena, that I met on the night train to Hanoi was visiting Kyoto at the same time I was. 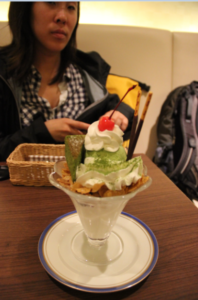 We managed meeting, had an early-evening conversation in a cozy cafe sharing a huge dessert. Another surprise was coming across to a friend from Hong Kong in the common area of 9hours. He’d been in Kyoto with friends in that particular “study break” as well. Overall, I loved this city so much! I could not visit as many temples as I wanted to, I even skipped a “must see” (Kinkaku-ji) due to bad weather. But I could spend more time walking in the random streets, checking out random shops and definitely meet more amazing people thanks to rain. Now I believe that Kyoto is even more beautiful under the rain.